Donated to the Daly House Museum by Bob Hoffman in 1979. 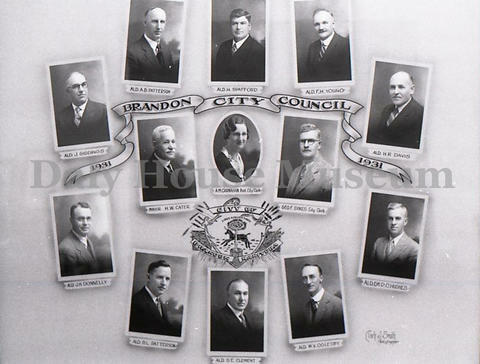 Composite photographof the members of the Brandon City Council in 1931. Pictured are: J. Giddings, A.B. Patterson, H. Spafford, F.H. Young, H.R. Davis, Dr. P.C. Hughes, W.V. Oglesby, D.E. Clement, B.L. Patterson, J.H. Donnelly, Mayor H.W. Cater, A.M. Carnahan (asst city clerk), and Geo. F. Sykes (city clerk).